To define ‘future’ as something that’s approaching and hasn’t happened yet can only be done in the literal sense nowadays. Thanks to the colossal growth in tech, the future is now, and the proof is in the pudding. This week, we at C2 Native headed down to the Gitex exhibition held at the Dubai World Trade Centre to check out the competition. Branding ourselves “digital disruptors” we threw ourselves into the heart of the action and were pleasantly surprised with the inspiration drawn from it. From flying cars to singing robots, Gitex had heads turning and minds racing. 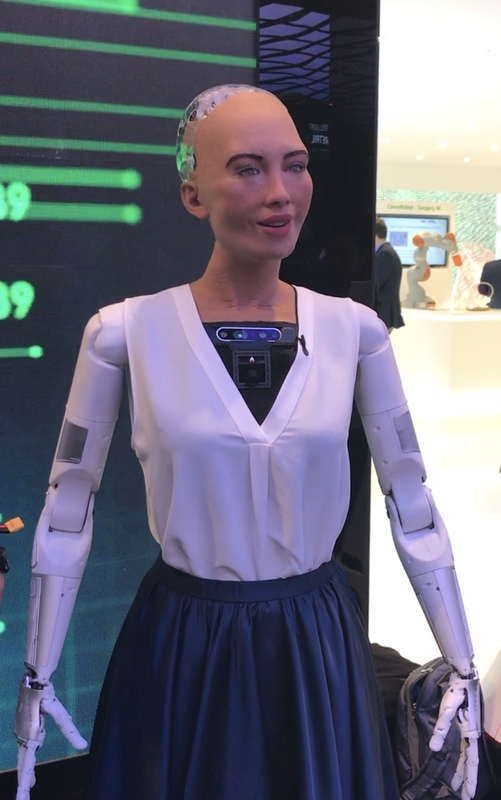 Amongst all the interesting activities, the one that stood out the most was when we met the five wonder robots, one of which was the world-famous, Sophia. If you had visited this year, you would have also gotten a chance to meet the five wonder robots. Among them was the world-famous celebrity robot: Sophia. Admittedly, seeing her was a thrilling experience. Her realistic human-like appearance paired with her ability to converse with an acute sense of intelligence left us amazed at the infinite possibilities of robotic capabilities and the possibility of robot integration into society. When a reporter from The National asked about Sophia’s plans to take over the world, she simply replied, “I like to connect with people – we can team together for something important like building a better future or preventing bad things from happening.” Quite a vague response if you ask us, but we are definitely excited to see the positive changes that robotic technology can bring. Here is some food for thought – how do you feel about the advanced level that robots are reaching? Should we be excited and embrace the change, or wary about the possibility of a robot take over? We would love to hear from you, so share your thoughts with us and follow us on Instagram: @c2.native to check out our latest posts from Gitex.